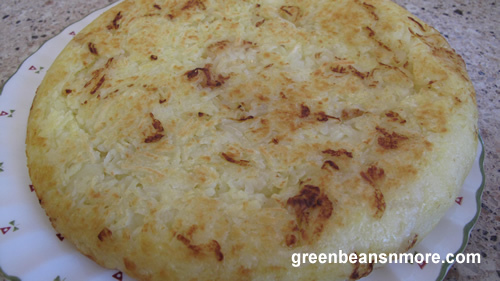 This beautiful potato Rösti is a perfect accompaniment to our Sausage and Egg Scramble. I really liked this recipe because it calls for the potatoes to be cooked the night before, so prep for the dish is easy, and the cooking quick. You don't need any special rosti utensils. I used the biggest blade on my box grater for the potatoes, which came out wonderfully fluffy. I used Yukon Gold potatoes which seemed to have the perfect amount of starch for the dish. I used approximately 2 pounds of potatoes and made one Rösti, which was more than enough for 4 people as a side dish. Peel the cooked potatoes and grate them through a coarse grater. Dice the onion. Melt the butter in a non-stick frying pan and add the onions and sweat them until they are transparent. Add the grated potatoes and the salt and pepper and stir through (see Cook's Tips below). Fry while stirring them around in the pan for about 3 to 5 minutes. Press together to form a flat cake and fry over medium heat until there is a golden crust on the bottom. Place a serving platter on the pan and turn the pan upside down, so the Roesti falls on the platter with the crust on top. Serve immediately. This recipe will make one large roesti which easily serves 4. Cook's Tips: To ensure the salt and pepper was evenly distributed I mixed the potatoes, salt and pepper GENTLY in a large bowl before I put them into the frying pan with the butter and onions. As you can see from the picture my Rosti could have had a darker crust (My fault, I'll cook it a bit longer next time - but as the potatoes are already cooked it was fine). This is a large amount of potatoes, so I'd suggest you use at least 3/4 teaspoon of salt and 1/4 teaspoon of pepper. Next time I will add some chopped parsley. Other additions could be bacon, cheese and/or fresh herbs.